During the three and a half weeks I spent in Africa I was often irritated by the slow pace of everything and thinking to myself that Africa will stay poor if Africans don't get more of a sense of timeliness and efficiency. But then during the journey home I learned the hard way that the most inefficient and disorganised people on the planet must be the Dutch, and they're not poor, so I must have been wrong. We took a plane in Zanzibar. A very long queue outside in the midday sun, customs officials asking a 'tip' for not checking our luggage properly, ... but the plane left on time. We changed to another plane in Nairobi. We spent about three hours of the four hour transit queueing, but... no real problems. Then we arrived in Schiphol (Amsterdam airport). We made sure we were the first off the plane and hurried to the terminal for our last flight to Brussels, but encountered a huuuuuuuuge queue for a passport and security check. According to the airport people, it's like that every morning. No wonder since KLM has all its long-distance flights arrive around 6am and then has city-hoppers leaving at 7am to get everyone to their final destination. That's the theory at least, in practice a LOT of people don't make it. Us, for example. After queueing for half an hour and not having made much progress, our flight appeared on a special monitor for the "short connection" line for people who have very little time to catch their connecting flight. So we left the queue and went to the short connection queue, where we were told that this queue was actually closed. Since the monitors kept telling everyone who had a flight within the next 20 minutes to go this queue, many other people kept going there and discovering that there was actually no short connection queue. Noone at Schiphol seemed to have the idea to turn these monitors off then so people wouldn't leave the main queue for nothing. Okay so we were among many, many people being late for their flight now, but by cheating ourselves into another queue and after a marathon sprint all across Schiphol we still made it to the gate of our Brussels flight 5 minutes before it was to depart. Normally you'd expect the plane to wait if you can't help being late, but in this case boarding had already closed though we had 5' left. Comment of the KLM staff when we told them we had RUN from their own Nairobi flight to this connecting flight: "Oh yes that happens every morning, it's an impossible connection". So, KLM actually sells tickets with a connection that its own employees know is impossible! These tickets cost us more than 1000 euro each btw. So now we had to go to a Transfer desk to see if we could get on the next plane to Brussels. At the entrance to this desk you had to take a number and wait your turn. After much waiting and not seeing the numbers go up, we and many other people there discovered that the staff behind the Transfer desk was actually not using its own numbers system though the whole infrastructure was there and working (e.g. big monitors). People started complaining, and one person lost his temper, so the leader of the staff decided that they'd simply stop working and call in the police. The next flight was fully booked, but since many of the next batch of KLM customers ALSO missed their connecting flight, we could get on it. Just like the staff predicted would happen - this is the KLM system apparently. In other news, I'll be presenting my book about the Antwerp language on the Boekenbeurs (Flanders' biggest book event) on Friday 2nd November at 14:30. By then I'll also need to have created the web site that goes with the book, so it's gonna be busy times the next few weeks. We made it to Zanzibar, we're in Zanzibar town now. This place is a curious mix of Arabic and Indian architecture, it's a maze of very narrow streets that reminds us of Varanasi in India, but it's much nicer. During the evening at least, we haven't seen it in daylight yet. Tomorrow morning we check it out, at 1pm we take a minibus to the northern tip of the island to finish this trip with some beach time. Dunno if I'll be online again here, in any case I'm back in Belgium on Sunday! We just got back from climbing Mount Meru - called Socialist Peak here - and it was great. On the second day we climbed from 2500m to 3500m very fast and wanted to continue straight to the top, but clouds gathered there so we decided to climb tonight like scheduled. We started at 2:15am this morning without having slept, and arrived on top at exactly 6am, a few minutes before the sunrise. Along the way we paused to make some moonlight pictures of the silhouette of the mountain and of the clouds below us, and they look great. We stayed on the top for an hour (very cold there though), taking many more great pictures. From Mount Meru you have an excellent view on the Kilimanjaro. On the way down we got to see the mountain and its crater (it had been too dark on the way up), looks very impressive. We're both exhausted now, so we're gonna sleep early. Tomorrow at 6am we head to Zanzibar. Today's a break day. We arranged our climb of Mount Meru, tomorrow morning we begin with a long walk to the first hut at 2500m. Monday will be a short steep climb to the second hut at 3570m, where we'll try to get some sleep before setting out at midnight to climb to the summit (4566m) in the dark to catch the sunrise. The last hundreds of meters we'll be walking on the crater rim, will be very cool but we'll only really see it on the way down. We do the whole descent right after summitting and should arrive back in Arusha Tuesday evening. Dunno if I'll have time to get online then, because Wednesday at 6am we're taking a bus to Dar-es-Salaam where we hope to arrive in time to catch the last ferry to Zanzibar, where we finish this trip. Today we arrived in Arusha after the safari, which was superb. We literally saw all the animals we could hope to see: lions, giraffes, hippos, a rhino, etc etc. Tomorrow we take it easy here, after that we start our climb of Mount Meru (about 4550 meter) which should take 3 days. More later! Ok here's more. I updated last time in Mwanza and that night when I went to bed I got very sick, had to throw up repeatedly and empty my bowels in all possible ways; I spent the night running between my bed and the bathroom. By 6am my body was completely empty. I couldn't eat or drink because I'd immediately throw up again. They always say you have to drink a lot when you have diarrhea but what to do in this case? :) Well I knew, because two years ago I had the exact same thing in Nepal. In the end it turned out to be giardiasis, a tropical parasite. This time it wasn't as bad as last time, during the day I started feeling okay except that I had to fight against sleep all day because I'd been awake so long (+30 hours) after the two very short nights between bus rides. This was the first day of our Serengeti safari and by the afternoon when we spotted a lion I could hardly lift my head from the seat in front of me. That evening we camped in tents, I just had a minute soup (my only food all day) and went to bed at 8pm with a sleeping pill and slept like a rock. Next morning I felt just fine and enjoyed the second day of the safari fully - this day we drove into the Ngorongoro crater, a fabulous landscape though the wildlife was a bit less abundant than in the Serengeti. Today was the third day and we could have visited the Lake Manyara NP but since by all accounts that's less interesting than the other two we opted to visit a snake zoo instead which was superb, they had all kinds of lethal pythons and cobras which were all very lively, got great pics and movies. In the afternoon we were dropped in Arusha. A very unpleasant place this, lots of tourist hassle, though we had fun walking into the football stadium where a match was taking place. If tomorrow I'm feeling 100% again then on Sunday we start to climb Mount Meru, which towers over this city. Alright I found a better internet cafe, let me recount the last few days. On Friday evening we wanted to check out the well reputed Bujumbura nightlife and ended up playing pool in an almost empty night club, kind of hilarious :) Saturday we attempted the difficult journey to Kigoma in Tanzania. On a traveling forum someone had reported recently that he had done it in 16 hours with 9 modes of transport, but our hotel in Buj provided us with a much better way. In the morning we took a minibus to the town Mabanda in southern Burundi, where we had our passports stamped for exiting Burundi. Then we had to make a long taxi ride through a kind of mountainous wasteland to arrive at the border with Tanzania. Crossing was no problem but on the other side the only minibus driver tried to extort an insane amount of money from us to take us to Kigoma. As usual hanging around with a seemingly indifferent attitude brought down the price a lot and we drove to Kigoma for some 20 euro. In Kigoma we were supposed to take a train to Dodoma and from there continue to Arusha but it turned out to be impossible to get tickets for any of the next trains. We seemed to be stuck there so we started trying to arrange a flight to Arusha but it would have still cost us a few days and be very expensive. After half a day of walking aroung agencies we decided to change our plan and head to Mwanza by lake Victoria and try to do the safari from there. We spent the rest of the day on the beach behind our hotel and swimming in lake Tanganyika some more. There were internet places in Kigoma but they were never opened so we couldn't get online btw. So yesterday we woke up at 4am to be at the bus at 5am. It left at 6am and was supposed to arrive at 6pm but we arrived in Mwanza at 11pm after 17h, of which half spent driving over gruesome dirt roads that would have torn most vehicles apart. The bus was so packed full of people that the guy collecting the payments had to crowdsurf to the back (where we sat). It was not fun. In Mwanza we could immediately arrange another bus to Arusha and decided to do that, so we got a hotel at midnight, went to bed at 1am and woke up at 5am again to get on the bus at 6am. After an hour on the bus we realised it was not going to take the short (15 hours) but expensive route through the Serengeti as we had been told, but the huge loop around the Serengeti over dirt roads that would take 48 hours (!). We got off the bus at the next stop, asked for our backpacks and took a minibus back to Mwanza. Our moods were very depressed at that moment, having slept 4 hours two nights in a row and spent all the other time on busses, but after a few hours we had managed to arrange a safari from Mwanza together with an Italian couple. We leave tomorrow morning and end the safari in Arusha (on the other side of the Serengeti) on Friday evening, so the safari itself is at once a transport to our next destination, very efficient. So at the moment we're in high spirits again, and it looks like the rest of this journey will go very smoothly. We'll just have to forget about the whole part between Bujumbura and Mwanza. We got to Kigoma alright on Saturday but got stuck there. We were supposed to take a train from Kigoma to Dodoma to get to Arusha but the railway organisation is so bad that it is impossible to get on a train without reserving a week in advance. So instead we made a gruesome 17h bus ride to get to Mwanza by Lake Victoria yesterday, and today we're trying to arrange a safari from here. So if I'm gone again for a few days, I'm on safari. I can't access my mail for the moment, I'll try again later. At the border we had to queue a long time twicand we thought everyone else was already through and worried our bus might leave us behind, but when we found it it turned out we were the first through customs and we had a drink with the bus driver while waiting for the rest. We talked with a Burundese guy and I took the chance to ask him how to pronounce the basic Swahili words - so now we can use some local language finally. We were in Bujumbura at 15h; what a beautiful location it has by lake Tanganyika and surrounded by mountains. We immediately took a taxi to the beach north of town which was superb; great water and waves, nice atmosphere with lots of locals doing sports, and mountain scenery all around including the Congolese mountains across the lake. The first week we've had cloudy weather most of the time but now I'm finally starting to get some colour. We just had dinner in a random restaurant and it was superb. So far we really like Burundi, pity we don't have time to stay longer. This was one of those days that started badly but turned out good. It took us 3 hours to get to the entry of the Nyungwe rainforest, much longer than expected, and there we were told that it is no longer allowed to hike through it without a guide (and I hate being guided) and that you're forced to pay 30 dollar each for one. Despite the long trip to get there we told them we'd rather not visit the forest at all then. My mood was far below zero at that point but we just started walking back over the road that cuts through the jungle and found several paths that ran into it, so we explored those by ourselves and ended up having a good time and seeing some nice stuff (like very weird trees). When we'd returned from our last and longest forray into the forest (a climb which gave us a view on Lake Kivu in the distance) and were just walking down the road again, we were picked up by a Serb who works in Rwanda. He gave us a lift all the way back to Butare, so we were back much earlier than expected and had time to shower etc. So a good day after all. Tomorrow morning we take a bus to Bujumbura, hopefully the Burundese border crossing won't be as unpleasant as the Rwandese one was (read below). Today was a slow day, visiting the genocide memorial in Gikongoro didn't take long, and the national museum here in Butare was disappointing. A good shopping day though, the museum's souvenir shop had good stuff and we found a supermarket run by a Lebanese guy. Tomorrow we make a day trip to the Nyungwe national park where you can hike through the jungle without a guide. I've uploaded a dozen more pictures to the web album btw, click below to open it. On Saturday we visited the Genocide Memorial in Kigali, and then we took a minibus to Gisenyi by lake Kivu. 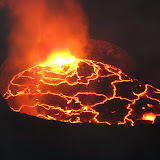 Next morning (yesterday) we crossed the border to Goma in Congo to go climb the volcano Nyiragongo. In 2002 this volcano erupted and the lava went right through the center of Goma, and nowadays it is one of only three volcanoes in the world that have a permanent lava lake (no idea what the others are, Danny read this somewhere) and we really wanted to see that. Eastern Congo is very dangerous because of rebel armies hiding there, but Goma is safe as it is protected by the UN and a general working for the Rwandese. Also, half my family has lived in the Congo for many years so I really wanted to visit the country. We were first driven around Goma, which is still scarred by the lava with many buildings wiped out and others still standing but with their first floor buried (they still use the second floor though :) ). Then we drove to the volcano through the refugee camps, which was very impressive. There must be hundreds of thousands of refugees living there in housing ranging from huts made of banana leaves to wooden cabins. We got two porters and a ranger with a machinegun to protect us. Climbing the volcano took 5 hours. I am completely out of shape and the altitude made my dizzy so it was tough, but we were on top at 5pm and the porters set up camp on the very edge of the volcano. The sight was incredible but it was still daylight. At around 7:30pm it was completely dark and the smoke cleared and we saw the lava lake in full glory. One of the most amazing sights of my life. Check the first picture in my web album. Wow eh? The lava lake is about 100m wide. The movies will be even better because I zoomed in a lot and they have the sound of the volcano, a loud rear especially when it was spewing fountains of lava. We slept in a tent on top of the volcano which was very cold (so I didn't sleep) and this morning we descended and now I'm back in Gisenyi. We just went for a swim in Lake Kivu - great beach but we couldn't relax because we had all our stuff with us and some local guys were acting very suspicious. Still had a nice swim each in turn though. Also uploaded a pic of that and some others to the web album. Tomorrow we head to Butare from where we will make two day trips, one to another genocide memorial and another to some of the oldest rainforest in Africa. Then it's on to Burundi. Laters! On Friday we woke up at 6am hoping to get the bus to Kigali at 7am, but it was full and so was the 9am bus. So we went to another company and luckily got a bus ticket for 9:30. We quickly checked out Kampala and then went to the bus station. The bus departed three hours late @&*()#^@#&*()$. At the border with Rwanda we had to run to get a visa before the migration office closed, but they refused to give us a visa because apparently we needed to arrange it in advance. We pleaded and tried to bribe them but nothing helped and it looked like we might have to spend the night outside between the two border posts, to be eaten alive by mosquitos, because our Uganda visa was already stamped. Luckily there was also an Irish couple and the woman did a great job pleading with the guy. After an hour he finally gave in while our bus driver was constantly threatening to leave. Anyway once in Rwanda things went great, it's a beautiful country, Kigali seems like a much more upscale city than Kampala, and the hotel and other facilities here are amazingly modern and clean. We're going to visit the genocide memorial today, check out the famous Hotel des Milles Collines (of the movie Hotel Rwanda) and then head to Gisenyi at lake Kivu. It may be a while before I update this site again because we'll climb a volcano. Hi from Uganda. Today we went rafting, it was spectacular, we did five grade 5 rapids and many smaller ones and flipped the boat 4 times. One of the rapids was a 3m vertical waterfall, somehow we didn't flip over that time. In total we rafted over 41km of the Nile, really amazing to paddle through such a landscape, both shores full of tropical vegetation and all kinds of birds sitting on rocks in the stream. I tried to make pictures with a disposable camera I brought but since I was in the water much of the time it got wet so they probably can't be developed. Tomorrow we head to Kigali in Rwanda, we still don't know where we'll go from there.